Boss launched their first handful of compact guitar effects pedals back in 1977 – the iconic OD-1 being the most recognisable in its yellow metal casing. They were an instant hit. Since then, they’ve featured on just about every recognised guitarist’s pedalboard in both prominent and subtle capacities. From the Digital Delay to the Super Chorus, the Blues Driver to the lowly TU-2 Chromatic Tuner, even the most niche and left-field players are more than likely to use a Boss pedal or two. Let’s take a look at a few current names who still use them in their setups. The Welsh frontman has crafted some huge hits over Stereophonics’ two-and-a-half decades of music. The Blues Driver has been fundamental in forming that ripping rock ‘n’ roll tone you’ve heard on a lot of their earlier, upbeat songs. It reacts extremely sensitively to picking dynamics. Boss’ TR-2 Tremolo is a slightly overlooked and even underrated pedal due to its simple three control knob layout and affordable price. But it’s been at the heart of Stereophonics’ and a plethora of bands’ sounds since its release in 1997. Last but not least, arguably the simplest and most effective equaliser on the market. The GE-7 does the job of bulky EQ pedals in half the size, and usually half the money. The seven in its name obviously stands for its seven-band EQ, which is an important tool in virtually every live setting. You’re able to reduce unwanted frequencies if you’re stacking overdrive, or simply sculpt your tone precisely how you like. Australian rock band Karnivool are all about creating unique textures in their music, and the Flanger BF-2 is one of the key ingredients. This ‘80s pedal is surprisingly versatile, with short modulated delay, chorus and vibrato sounds packed into its four dial parameters. 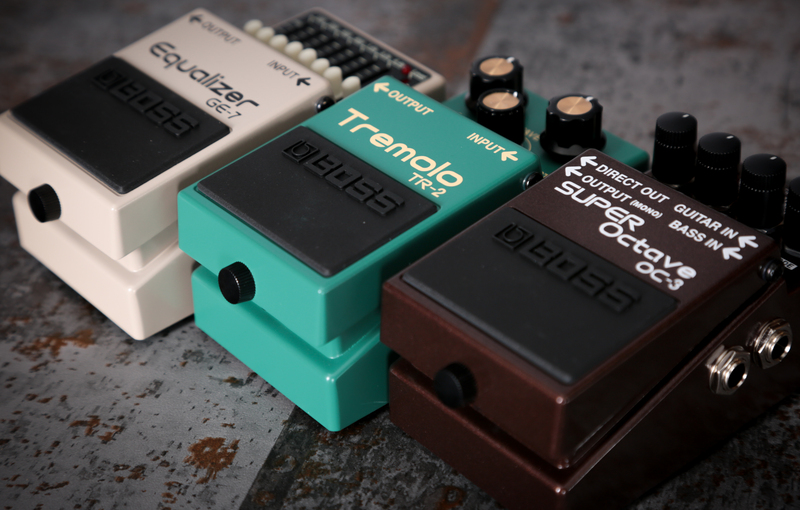 The Super Octave does exactly what it says on the tin, like most Boss pedals in the range. But this one is a bit more advanced: it’s polyphonic, meaning you can play chords and still obtain the octave. You have three modes, including a Drive mode for a little bit of fruity gain. Finally – an oldie but goldie. Mark Hosking says he uses the DS-1 Distortion on just the one song, Goliath, for a wash of horrible crippling noise. It can clean up a fair amount, but where’s the fun in that? Incubus founder and guitarist Mark Einziger is renowned for his casual use of effects pedals sprawled over their eight albums (and counting). His monolithic, supremely expensive pedalboard has a whole section dedicated to Boss pedals, so the three mentioned are just a handful of the stompboxes you’ll hear in the Incubus sound. The Boss PH-2 is the daddy of phaser. Released back in 1984, it’s had a few iterations over the years. But nothing comes close to the worn-in, tonally rich original Boss pedal Mike uses. It possesses a sound instantly recognisable by Incubus fans, as you can hear plenty of clean guitar signal underneath the effect with the PH-2’s Depth dial reigned in. Sticking with the retro theme, the 1986 Boss CS-3 compresses a guitar signal and makes it super punchy – great for solos like on the song Pistola. The now discontinued RV-3 Digital Reverb/Delay is a truly versatile tool that Mike says he uses to create a brittle, harsh sound because of its higher frequencies. Used on Megalomaniac from A Crow Left of the Murder. Moving onto prettier sounding things, the Acoustic Simulator is a mainstay on the Weezer lead guitarist’s pedalboard. This turns your electric guitar – in his case the famous sparkly Explorer – into an acoustic in one stomp of the switch. It has a realistic timbre and percussive sound he uses on the likes of My Name Is Jonas. And of course, this is just one example of a pro player using the TU-2. One of the most reliable tuners ever made, in terms of its tuning precision and ability to withstand the likes of a nuclear winter. It has a full LED screen and the renowned tough as nails casing. What more could you ask for? Here’s an example of why a noise suppressor is so important in heavy music. Brent Hinds keeps control over the sludgy, Mastodon high-gain with the help of the NS-2. It reduces unwanted noise in your signal, as well as cutting off all sound when you’re not playing. Pretty much an essential if you play with any kind of overdrive or distortion. Are you after a delay that can reproduce exactly what you play without the grit or fade of a vintage tape? The DD-5 is the perfect, inexpensive solution. Great for ambient passages, unique sounds and stereo panning. Brent can testify to this. 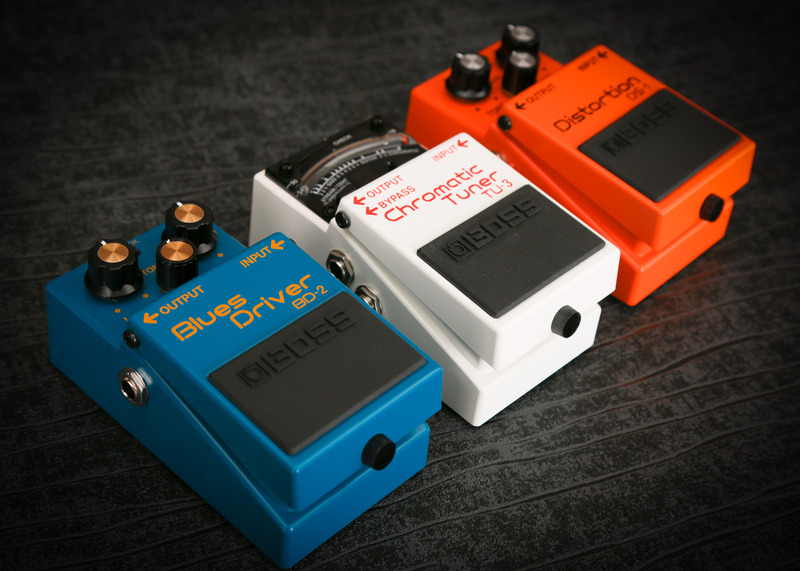 Learn about the Waza Craft range of Boss pedals.